I have never before made Chinese dumplings. They seemed a little intimidating, but when I saw a recipe from Kelsey Nixon on the Cooking Channel, I thought I would give it a try. I am glad I did, because they were a big hit! 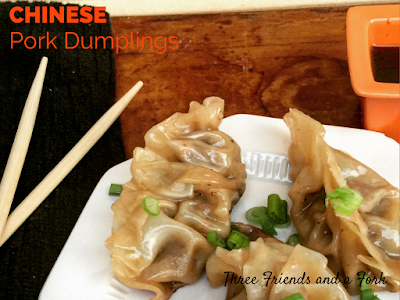 You should try your hand at making these tasty and simple dumplings. 1 pack round dumpling wrappers (If you can't find round wrappers, get egg roll wrappers and cut into circles with large biscuit cutter. Put 2 t. sesame oil in skillet. Heat skillet and add green onions, grated ginger and minced garlic. Cook for 1-2 minutes until onion softens. Do not let them brown. Turn heat off and let the mixture continue to soften while you work on the rest of the recipe. In a medium bowl, combine ground pork, egg, five spice powder, hoisin sauce, and 2 t. soy sauce. Add the onion and garlic mixture to the meat mixture and combine. If you could not find round dumpling wrappers, you will need to cut circles from eggroll wrappers with a large biscuit cutter. Notice one side of each wrapper is floured and one is not. The floured side should go down when assembling dumplings. The wrapper on the left is incorrect with the floured side up. The one on the right is correct with the unfloured side up. Cut circles with the largest cutter you can find. Place one teaspoon of meat mixture in center of each wrapper circle. I used a small scoop for uniformity. Wet edges of circle with small amount of water on your finger. Pinch and fold to stick sides of wrapper together. Heat 2 T. grapeseed oil in skillet and add dumplings. Cook until dumplings brown on bottom, 1-2 minutes. Add 1/2 cup water to skillet and cover. Cook over low heat for 8-9 minutes until water evaporates and dumplings are cooked through. Remove from skillet, sprinkle with extra green onions and serve with sauce on the side. See how easy? Give these dumplings a try and let us know what you think!